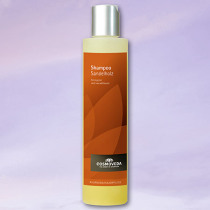 Shampoo Sandalwood Cosmoveda, Cosmoveda Sandalwood Shampoo provides a sensual experience with the precious aroma of genuine Indian Sandalwood and cleanses the hair with valuable extracts of Guduchi and organic Amalaki. Ayurvedic herbal oil extracts (Thaila) have a balancing effect on the hair and scalp, while the contained sesame oil is re-moisturizing the scalp. Cosmoveda Sandalwood Shampoo contains very mild, non-irritating surfactants from vegetable raw materials and is suitable for all hair types (Tridosha Balance). Water, mild vegetable surfactants, sandalwood hydrosol, rice proteins, herbal oil extract (Taila) from sesame oil*, Guduchi and Amalaki*, Sodium PCA, benzyl alcohol, xanthan gum, lactic acid, sandalwood essential oil. Aqua, Cocoglycoside, Sodium/Disodium Cocoyl Glutamate, Santalum Album Water, Hydrolized Rice Protein, Sesamum Indicum Seed Oil*, Sodium Pca, Benzyl Alcohol, Xanthan Gum, Lactic Acid, Santalum Album Wood Oil, Emblica Officinalis Fruit Extract*, Tinospora Cordifolia Plant Extract*.